With the European Championships on the horizon, here’s Jack Jackman with his Group A preview and the best bets for four teams involved. FRANCE (1.37 at 888 Sport): The hosts are huge favourites for this group and it’s hard to back against them. None of the other three have great histories internationally, with this being Albania’s first ever tournament. Although the French often struggle at tournaments for a variety of reasons, including infighting within the squad. That looks unlikely this time with the players appearing driven to win on home soil. There have been some interesting decisions made by Didier Deschamps in terms of selection, with Moussa Sissoko being chosen ahead of Hatem Ben Arfa. However, the side looks well balanced and has recovered well from the enforced absence of Karim Benzema. I expect the hosts to win this group easily without defeat and they could be the ones to beat for the tournament outright. 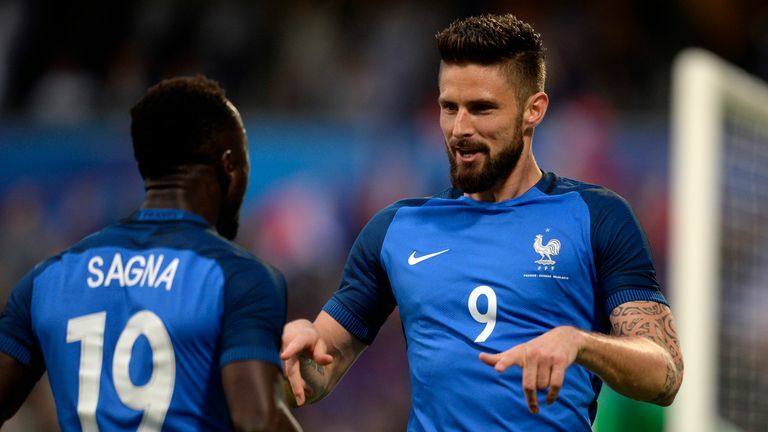 FRANCE – OLIVIER GIROUD (4.50 at SkyBet): The Arsenal frontman is much maligned by the fans of his club and national side, but he appears to be his country’s biggest guarantee of regular goals. In the absence of Benzema and Alexandre Lacazette, he looks set to lead the line and could flourish with Antoine Griezmann and Anthony Martial playing either side of him. He is good at bringing others into play and with deadly finishers on the wings, Giroud should be allowed more space. His finishing isn’t the best, but his awareness and movement in the final third is very effective, which allows him to be a huge goal threat. He has scored six goals in his last five starts for the national side and has confirmed himself as the nation’s first choice forward ahead of the opening match against Romania. He could silence his critics this summer and go back to Arsenal with a case to be their first choice striker again next year. ROMANIA – FLORIN ANDONE (15.00 at Boyle Sports): There will be lots of young exciting players who make a name for themselves this summer, and the Romanian forward is one of those. He had an excellent season in the Liga Adelante scoring 21 goals. He is a great finisher and is excellent at finding room in the final third, while he can be a threat in the air. He is expected to start the tournament as Romania’s first choice striker, after making his debut in 2015. He has one international goal to his name which came in a friendly against Italy. He will be looking at this tournament as an opportunity to establish himself as a key part in the national side’s future and attempt to attract interest in his services. Andone has the potential to excel in a larger league and I expect him to show that in Group A.
ALBANIA – ARMANDO SADIKU (9.00 at Betfair): The Albanian squad isn’t blessed with goals and are unlikely to score a lot this summer. However, their first choice striker Armando Sadiku has the ability to produce a goal and he could be a threat in Group A. He has plied his trade in Switzerland for the majority of his career, scoring regularly both in the Swiss Challenge League and the Swiss Super League. He scored twelve times in the Swiss top flight this season for FC Zurich and Vaduz. He started the season at FC Zurich, but forced a move in January in order to play regularly to prepare for this summer, and it turned out to be a wise decision. He is coming into the competition in great form, having scored in both of Albania’s pre-tournament friendlies. SWITZERLAND – XHERDAN SHAQIRI (6.00 at William Hill): The Stoke winger is integral to his national side, and will provide the primary goal threat this summer. They may have scored 24 goals during qualifying, but the Swiss failed to score in three of their ten qualifiers. An incredible 14 players shared the 24 goals, showing that the side lacks a quality striker that will take the majority of the goal scoring burden. However, in Shaqiri, they have a dynamic, skilful attacking player, who is capable of producing goals out of nothing. This will be important in such a tight group, with Romania and Albania being tough to break down. Switzerland don’t have the best attacking unit, and they won’t blow sides away this summer, but they have a match-winner, and they are worth their weight in gold in international tournaments. Albania to finish bottom of the group (1.91 at Coral): They are new to the competition and have done incredibly well to get this far, but I expect the quality to be too much for them in this group. Switzerland are regulars at international tournaments and that experience will be difficult for the Albanians to compete with. While the Romanian side is very exciting with lots of good young attacking talents, and I expect them to be good to watch this summer, qualifying for the final 16 in the process. It will be a good experience for the Albanians, but don’t expect them to go far. Romania to qualify from the group (1.83 at Coral): The Romanians have a very exciting young side, with the likes of Florin Andone and Nicolae Stanciu hoping to breakout during this tournament. They are reliant on good organisation and pressing, while in the attacking third, they have dynamic players to make a difference. They could be one of the surprises of the tournament, and I expect them to give France a tougher opening match that everyone is predicting. France -2 vs Albania (2.88 at BetVictor): This France side is well balanced and is their best squad coming into an international tournament for years. They may be missing big name Karim Benzema, but the options in the attacking third are mouthwatering. They have looked great in the pre-tournament friendlies and I expect them to put on a show against the Albanians. They could win this match by four or five.